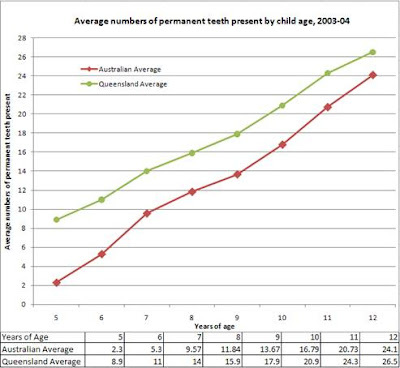 "FAN-Australia drops a bombshell on Water Fluoridation"
Haines has found in the ARCPOH statistics that the permanent teeth of children in largely unfluoridated (<5% before 2009) Queensland were erupting on average two years earlier than the children in the rest of Australia, which is largely fluoridated (see the figure below). A two-year delay would negate all the small reductions in tooth decay claimed by dental researchers since 1990. In other words fluoridation doesn't work. Any difference in tooth decay claimed to be due to fluoride is simply an artefact of the delayed eruption caused by fluoride. Less teeth erupted for any given age would mean less surfaces available for tooth decay to have taken place. A delayed eruption of one  two years would account for the small reductions claimed in ALL the US and Australian studies published since 1990 (Brunelle and Carlos, 1990; Slade et al., 1996; Spencer et al., 1996; Armfield et al., 2009; Armfield, 2010). These studies have found reductions ranging from 0.12 of one permanent tooth surfaces saved in Western Australia (Spencer et al., 1996) to 0.6 permanent tooth surface saved in the largest survey ever conducted in the US (Brunelle and Carlos, 1990). This is not very much when you consider that there are five surfaces to the chewing teeth and four to the cutting teeth, and by the time all the childs teeth have erupted there are a total of 128 tooth surfaces. One tooth surface saved amounts to less than 1% of all the surfaces in a childs mouth. Now even this small benefit has evaporated. In 2000, the York Review pointed out that none of the studies that they had reviewed had controlled for "the number of erupted teeth per child (McDonagh et al., 2000, p.24). In 2005, Komarek et al. did control for eruption of teeth and reported no difference in decay between children living in Belgium receiving fluoride supplements (and those who werent) that was relatable to fluoride exposure (as measured by the severity of dental fluorosis). In 2009, Peiris et al. reported that children in largely fluoridated Australia had a delay in "dental age" of 0.82 years compared to children in largely unfluoridated UK. However, the authors did not discuss the possible reasons for this delay and the number of children involved in the study (about 80 in each country) was not very large.